Welcome Here, we provide professional quarry Equipment for quarry plant , to understand more can send us an e-mail or telephone. 1.It is used for producing building aggregate,concrete,aggregate for road surface and roadbed,asphalt concrete and cement concrete. 2.It is also used for sand making and shaping in the field of engineering such as water conservancy,hydroelectric power,high-class highway,railway,bridage and municipal works. 3.It is used in fine crushing of ming industry such as building materials,metallurgy,chemical engineer,ming, anti-fire material,cement ect. 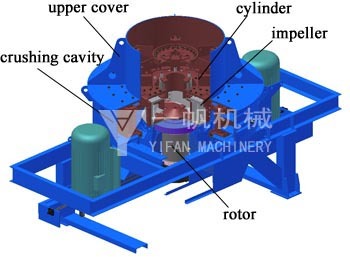 4.Vetrtical shaft impact crusher is used for producing glass raw material and quartz sand ect. Material falls down to impellor cavity. Under great centrifugal force, it hits material that coming downwards. After hitting each other, they force a vortex between impellor and shell, and hit each other several times, finally smaller stone comes out, and goes to vibrating screen. Satisfactory material is transported by conveyor belt. However overlarge material will go back to Vertical Shaft Impact Crusher to be recrushed. Output sizes can be made according to customer’s requirement. 1、Simple and reasonable structure, lost running cost. 2. High crushing rate, energy-saving. 3. It has fine crush and coarse grinding function. 4. It is little affected by the moisture content, and the content can get up to about 8%. 5. It is suitable to crush midium hard, hard special materials. 6. Excellent product of cubic shape, and small fraction of elongated flaky particle shape. 7. Small wear from Impeller liner, and easy maintenance. 8. Working Noise is lower than 75 decibel, dust pollution.